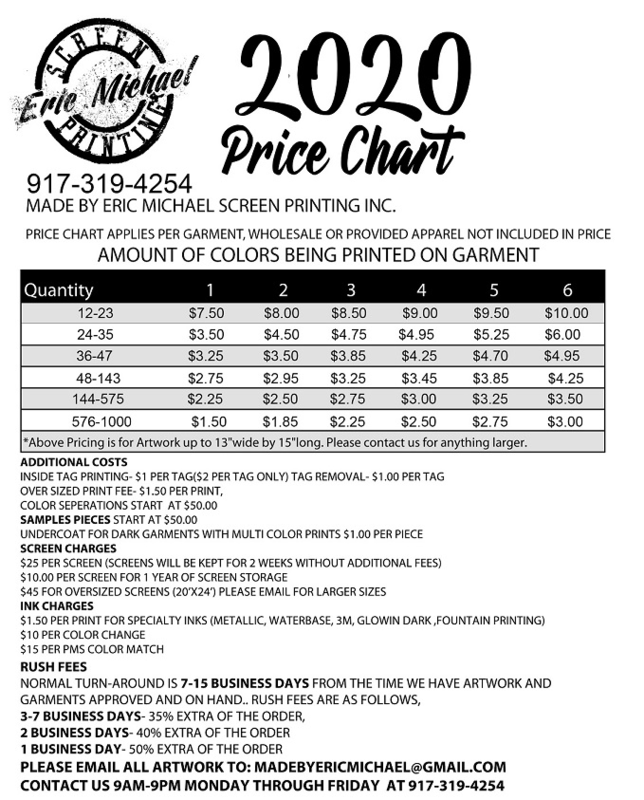 We are a full service custom screen printing shop in the Bronx offering the best quality and prices in the NYC. Contact us today for a free quote. We typically reply with a quote within 24 hours, including weekends. Discharge ink is a water based ink with a bleaching agent added that soaks into the shirt's fabric leaving it super soft. The discharge agent mixed into the ink removes the dye in the shirt during the printing process. After printing, shirts need to be washed and folded immediately in order to feel the vintage looking results of this process. Discharge is considered a specialty ink. Water-based inks are a good choice when a "soft hand” is desirable. A soft hand is the condition where the ink film cannot easily be felt with the hand when passed across the surface of the fabric. This affect is often used as an argument for why water-based is preferable to plastisol as plastisol has more of a hand than water-based. Water-based is considered a specialty ink. Plastisol ink is a PVC (Some inks are Phalide Free) based system that essentially contains no solvent at all. Along with UV ink used in graphic screen printing, it is referred to as a 100% solid ink system. It is the most commonly used ink for screen printing. We do not charge extra for plastisol inks. Metallic inks such as Metallic Silver, Metallic Gold, Metallic Bronze, and 3M reflective silver are specialty inks, that have aluminum fibers added to give a metallic feel. They are great for anyone looking to add something different and unique to their screen prints. We charge extra for Metallics as they are a specialty ink. We offer free help with layout and simple color changes. We also offer vectoring services starting at $25, which completely master your artwork and removes all pixelation. We also offer in-house graphic design starting at $50 an hour. We have over 10 years of experience working with all sorts of different graphics and graphic programs.